I'm Barry Petersen and this Letter From Asia comes from Kyoto, Japan's ancient capital. One of the wonderful things about living in Japan is, every now and then, touching tradition in arts or clothes…traditions that sometimes go back a thousand years or more. But in today's Japan, with Internet savvy young people, the old ways are something they think of as, well, quaint. And they could spell traditions doom. We happened upon this parade at a temple in Kyoto. It marks the time hundreds of years ago when a Japanese Buddhist monk brought green tea to Japan from China. 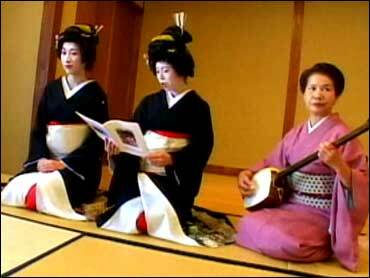 Yet, Kyoto is not so much famous for tea as it is for its Geishas. And, trust me, you'll have an easier time spotting them on the movie screen than on the streets of Kyoto. But we did find Peter MacIntosh, whose small bar often hosts parties with Geisha and whose camera finds them as well. This is his wife, who had to quit being a Geisha when she married. Those are the rules. There are about 280 Geisha these days. Years ago there were 2000. And let's face it having Maiko Geiko, as the Japanese call them, as a highlight to dinner is pricey. "You're looking for a quick evening of entertaining, singing and dancing…from 350 dollars to about 700 to 800 per head depending on the number of Maiko Geiko, and depending on the meal, of course," MacIntosh explains. "It can be," admits MacIntosh. "Lot of people pay a lot more for superbowl tickets." Some Geisha are making money in rather creative ways. Like holding one day classes where you can enter as an ordinary woman and end up looking like a classic geisha. For 40 years, Koccho-san has been a geisha. She has watched times change. "When we played our music, customers would sing along with us," she says. "Now a lot of customers don't know the songs anymore." "There is still a living to be made," she says, "in appearances for tourists." Geisha Namichiyo-san talked of young people who no longer want the years of training or hours of daily reparations it takes to be the real thing. "If the geisha disappear," she says, "Japan will be a different country." Even in a country whose history goes back thousands of years, our modern times can leave little room for traditions. And traditions once lost leave an empty hole in a culture that can never be filled.